Garde Mangers, and Culinary Instructors. One-to-one, private instruction is provided by Paul Germain and AICD's Adjunct Instructors who are award-winning, world renown culinary artists in their own right. 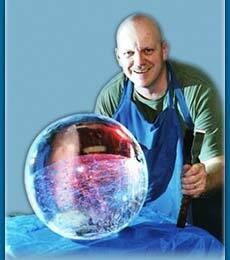 Your instruction will include carving secrets from European, American, Thai, Chinese, and Japanese masters. The projects are designed to not only provide the "wow" factor, but also incorporate them as practical designs and skills that chefs need for important seasonal holiday presentations and other special occasions. projects completed during his two days of instruction. carved from fruit and vegetables in just one weekend of private instruction. "After Arriving at Mr.Germain's home, he made me feel very welcomed and comfortable. The atmosphere that Paul and his wonderful wife create is perfect for learning. With the knowledge and and skills that Mr.Germain has he is fully able to answer anybody's questions. When Paul is teaching, he makes sure that everything he is teaching you is explained very thoroughly. The hands on experience is priceless. Paul is a wonderful teacher that wants to make sure that when you leave, you will be leaving with confidence and pride because of the capabilities you have achieved. When I was younger I wanted to carve! But I wasn't sure if I had the skill to create art from fruits and vegetables. Although I did not have much knowledge of carving, Paul started showing me and explaining how anybody can be an artist. If anybody gets the opportunity to learn from Paul Germain, it is a sound investment. He has taught me skills that will further my career as a chef. Again, thank you for all the skill and knowledge you have taught me." projects completed during her two days of instruction. finishes one of her smaller projects from a turnip. vegetables that were completed during the Certified Food Artist Program. "It was an amazing experience going through the Food Artist program. The Food Artist program gave me all the techniques and confidence I needed to create beautiful designs. All of the instructors made me feel capable of achieving my goals as a carver and as an artist. This program is a great tool for all chefs that want to add more beauty into their work...Thanks a lot for making me feel at home." Providing far more instruction than what mere demonstrations of complex carvings can provide, Paul Germain's totally immersive, one-to-one, hands-on training techniques and real life applications make even the most detailed features of AICD's fascinating instructional programs come to life. Paul's break through methods of training prove to be nothing short of contagious for highly motivated chefs and culinary instructors who want it all - their testimonials then say it all! This course is customized to your needs as an Executive Chef, Garde Manger,or Sous Chef, and is taught by Paul Germain and AICD's Adjunct Instructors. We invite you to call Paul personally for more information. Note: This course of private instruction has primarily been developed for Executive, Sous, and Garde Manger Chefs. However, in certain circumstances, the requirement for having this level of culinary experience may be waived. 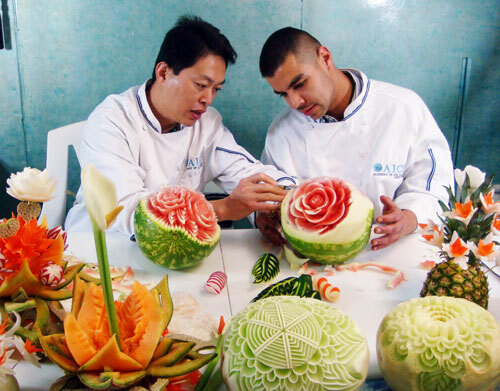 private instruction in the art of fruit carving and vegetable carving. 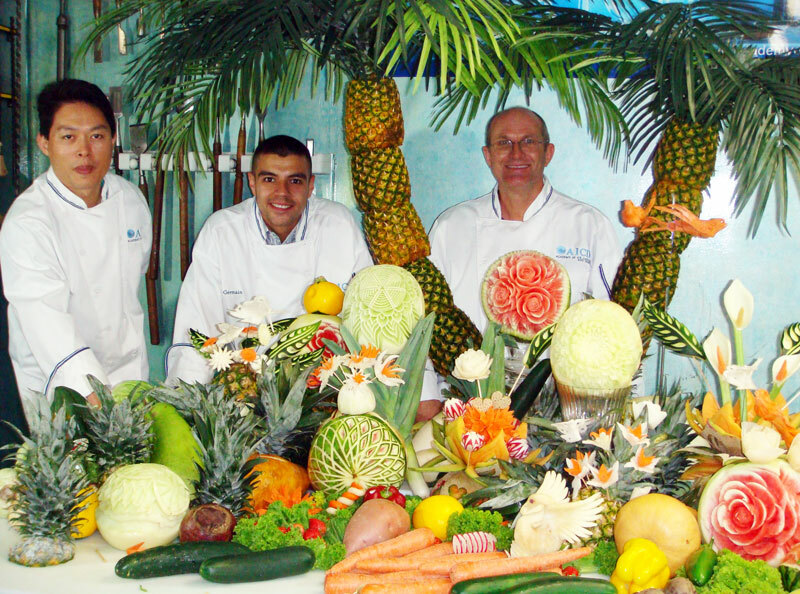 AICD is able to treat students to an unparralled selection of high quality fruits and vegetables for incredible food carving artistry. We also bring in exotic fruits and vegetables from around the world. In addition to providing comprehensive private ice carving instruction and ongoing support for graduates, AICD will be hosting special events featuring well known leaders in the food carving and ice sculpting industry who have distinguished themselves in either the commercial or competitive arenas. Please send Paul Germain an email indicating that you would like to be notified about these events. These events will be scheduled based upon student interest. AICD's comprehensive two day (30 hours, including 10 hours of art related homework in preparation for the next day's instruction) Certified Food Artist (CFA) Program of private instruction is especially designed for chefs, and garde mangers who need the professional and competitive know-how for designing, carving, ordering and selling very artistic Thai food carvings. 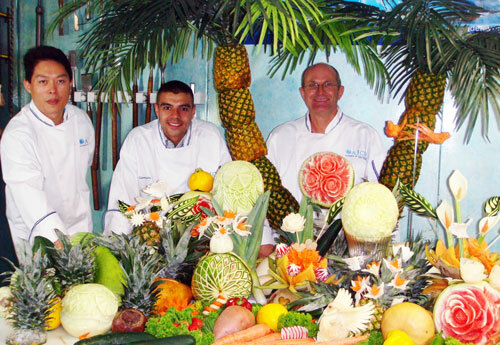 Through intensive hands-on lessons, Paul Germain's unique and rigorous training system will give you confidence in creating custom designed fruit carvings and vegetable carvings. AICD's Adjunct instructor is world renown fruit and vegetable carver Chef Ray Duey. The savings in time, tuition, meals, and lodging make our Certified Food Artist (CFA) the most popular program of choice for companies who wish to offer immediate beginning level instruction for their chefs and garde mangers. Our goal is bold: to make it possible for you to gain a greater overview of professional food carving through hands-on experience than has ever been possible in such a short period of time! Special Note: AICD provides one-to-one personalized instruction that is tailored for each student's experience and future objectives. Private instruction ensures that student carvers of any level receive far more actual training and individual guidance than is possible within group ice and food carving classes. It also provides a much safer and more productive learning environment for developing the skills needed for selling and safely carving highly realistic and creative fruit and vegetable carvings. The most important and innovative techniques of professional Thai fruit carving and Thai vegetable carving have been condensed into a single 30 hour program. Due to the fast-paced intensity of this custom program, it is best suited for private instruction of students who are capable of optimum concentration and physical stamina. Our unique program includes hands-on training in many of the highly specialized "secret food carving techniques" and tools developed by many of the most advanced and celebrated professional fruit and vegetable carving artists around the world today. In addition to providing students the opportunity to use a huge selection of food carving and design tools, a complete library of fruit and vegetable carving books is available. Paul Germain has been collecting fruit and vegetable carving books since he first started training as a Garde Manger Chef over 35 years ago. The AICD library is filled with 65 of the most artistic and creative fruit and vegetable carving books that have ever been published. Students have the rare opportunity to view and be inspired by the incredible food artistry in these books in the comfort of the AICD studio or at their hotel. 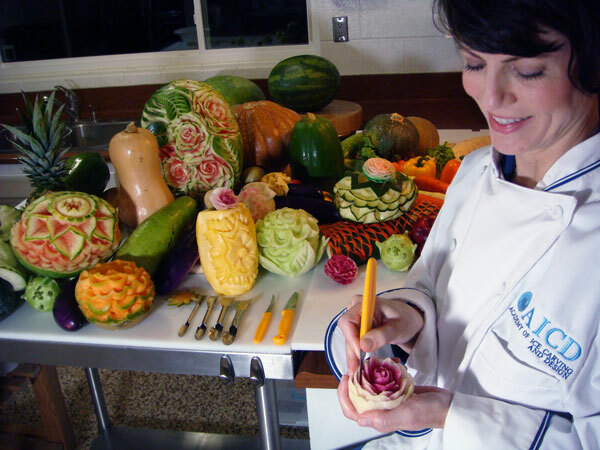 AICD's Certified Food Artist (CFA) Program in Fresno, California is ideally suited for any culinary school, hotel, country club, caterer, or restaurant that is in need of immediate food carving training. 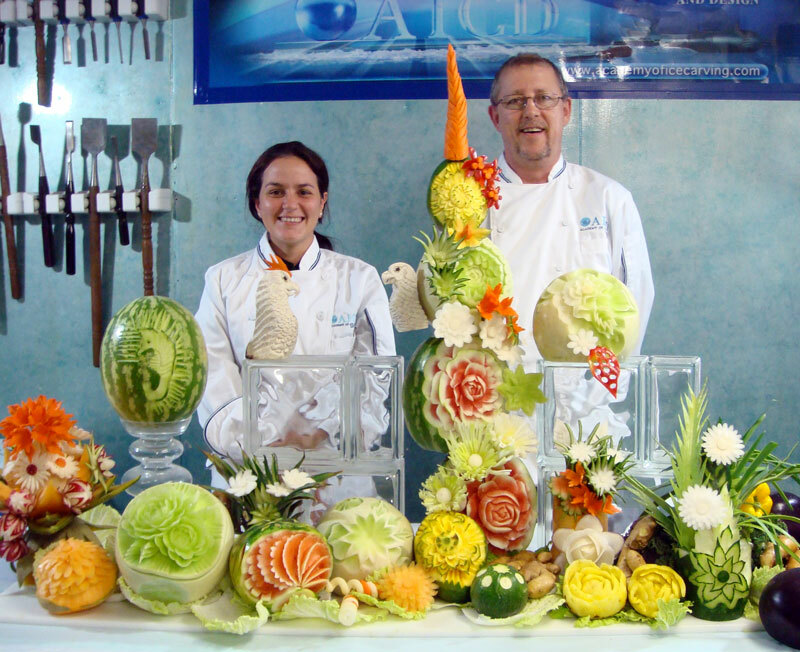 The AICD Certified Food Artist (CFA) Program includes three days (30 hours including art related homework in preparation for the next day's instruction) of intensive, hands-on, private fruit and vegetable carving instruction. The AICD Certified Food Artist (CFA) Program is designed to teach a broad range of ice carving and culinary design skills and technologies needed for those who sell and market ice sculptures and Thai food carvings. Our private, one-on-one instruction is available for highly motivated carvers who want to advance at a rate that is optimum for their learning style, skill, and level of experience. Private instruction is adapted to suit the individual sales person's needs. The arts of fruit carving, vegetable carving, and ice carving involve the use of tools and equipment that are inherently dangerous. To meet the safety-related needs of hotels, country clubs, and caterers, a high priority is given to the development of safe carving, delivery, and set-up practices. This program requires that the carver be in excellent health. The ice carving and food carving industry is growing at a phenomenal rate in Fresno, California, the U.S and around the world. 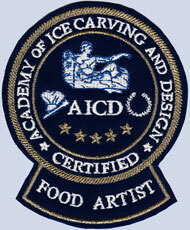 AICD is dedicated to providing the most comprehensive ice sculpture training, fruit carving training, and vegetable carving training possible for ice sculpture companies, hotels, caterers, country clubs, and culinary schools seeking to employ highly qualified, professionally certificated chefs, garde mangers, and ice carvers.